Fred from Kentucky stood on the top deck of Island Passage with arms stretched towards the Hauraki Gulf. “Why would y’all want to travel overseas when you have the world on your front doorstep?” ? ?His enthusiasm was not lost on the New Zealanders who had stepped on board the spruce vessel berthed at Auckland’s Princes Wharf. We were about to embark on a voyage of several days out on the Gulf. My previous trips out on the Hauraki Gulf had been on yachts, keening into the wind and lashed by sea spray. Setting forth in a luxuriously furnished cruiser with the amenities of a much larger vessel made me see familiar waters in a whole new light. It was pleasant setting off with only 20 passengers onboard, the maximum overnight guest capacity to ensure all onboard enjoy the luxury of space. This guarantee of luxury seemed assured when I opened the door to my cabin and found it as spacious as those on much larger cruise ships. 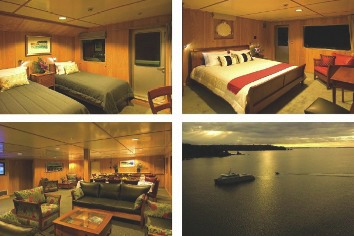 The ensuite cabin opened to the outer deck – all the better to watch the islands of the Gulf go by. I doubted the satellite television in the cabin would get much use – it would have to compete with the great outdoors. For starters I planned to sit in the fisherman’s chair at the stern with rod in hand. Bolted in place and built to swivel on command, the elegant chair looked more like a throne. During our voyage it would attract many claimants. Whilst Island Passage can carry up to 200 day trippers, during the two to five night cruises, passengers have the bar, dining room, library and decks to themselves. Our group soon settled into a relaxed camaraderie while the friendly crew padded about with quiet efficiency. On the upper deck I spied a helicopter, snorkelling and fishing gear, kayaks and three boats for shore and fishing trips. We climbed into one of these boats at Waiheke, the first of several island ports of call. With flexibility at his fingertips, Island Passage’s skipper, Paul Mabee, anchored firstly off a quiet cove with access to a coastal walk. 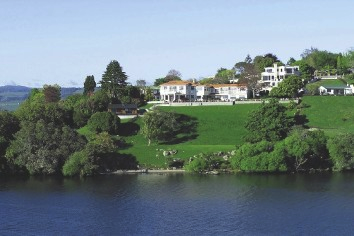 Waiheke is an attractive island with its many beaches, numerous vineyards and smattering of holiday houses and permanent residences. Paul then chose a tranquil bay at the sparsely populated eastern end of the island for our next anchorage. The feeling that the world was our oyster intensified as Island Passage sailed across to the Coromandel Peninsula. At its tip, the peninsula rises in a final farewell to the mainland before plunging into the sea. Dolphins are often sighted in the two hour stretch across to the Great Barrier, and a pod showed up for our entertainment, racing between the twin hulls with spellbinding acrobatics. Passengers tried their luck with rods and landed both Snapper and Kahawai. Both wound up on the chef’s barbecue, although I did feel a twinge of regret that such splendid fighting fish ended their lives on a platter. Otherwise, the on-board cuisine went down in a haze of salt sea satisfaction. The chance to mitigate the effects of the irresistible deserts arrived when we anchored off Great Barrier Island. Beside the sheltered waters of Port Fitzroy, sailmaker and yachtsman turned conservationist, Tony Bouzaid, has built walking trails through Glenfern, his native bush covered property. Port Fitzroy is a mere snapshot of Great Barrier, still largely forested thanks to its distance from the mainland. Spectacular beaches and coves, as well as a mountainous interior, make it a boatie haven in summer. For the rest of the year it settles back into dreamy tranquillity. ? ?Before departing Great Barrier Island, the helicopter took off with two passengers bound for Auckland. We didn’t envy them. Obliging weather meant that Island Passage and her remaining guests could proceed to the Mokohinaus, the most distant islands on our voyage. Apart from a lighthouse, the small and resolute Mokohinaus and their remarkably clear waters belong to the birds that nest in their rocky crevices.? ?On the home run, we anchored off Kawau Island on a textbook perfect day, the Gulf waters glistening under a cloudless sky. A couple of wallabies, the legacy of the exotic menagerie of animals Governor George Grey introduced to Kawau in the late 19th century, were munching grass near his island home, Mansion House. These normally shy animals were in no hurry to leave the herbal delights of the governor’s garden! Tiritiri Matangi Island was our final port of call and, as on Kawau, there were no roads or cars. Instead, the 220-hectare island is a sanctuary for endangered native birds. Tiritiri Matangi had originally been covered with native trees, but centuries of human occupation had transformed the island into grass and, in a pattern that was too prevalent on the mainland, the wildlife struggled to survive. The tide turned in 1967. Predators were eradicated and hordes of volunteers began planting thousands of trees on Tiritiri to lure the native birds back. School children who helped plant trees in those early years now return to the island as adults to walk the tracks through the bird filled bush. Native bird species that have been driven close to extinction by predators on the mainland are now thriving on Tiritiri Matangi. When you visit, watch out for the handsome Saddleback, petite Whiteheads, Robins and Bellbirds. Patience is sometimes required to spot the shy Kokako and, in this safe environment, the ground dwelling Takahe and Little Spotted Kiwi also feel quite at home. Up at the café near the island lighthouse, comical Takahe birds are star attractions. On the final night of the cruise, I met with my fellow passengers on deck for farewell cocktails. Fred from Kentucky led the charge with a round of superlatives about the Hauraki Gulf. Rudyard Kipling’s poetic description when he visited New Zealand in 1891 came to mind. “Last, loneliest, loveliest, exquisite, apart.” The famous phrase is often applied to Fiordland, but Kipling was indeed referring to Auckland and its gulf of islands. 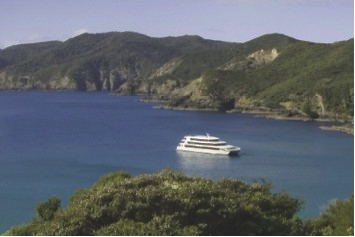 Hauraki gulf cruises of 2 to 5 days sail from December through April. During November, Island Passage operates in the Marlborough Sounds and from May to October she operates cruises in Vanuatu. Facilities: dining room, library, alfresco bar, saloon bar, wide screen plasma televisions in main recreational areas, BBQ area, 6-seater twin-engine helicopter, two sport fishing boats and one passenger transport boat, fishing and snorkelling equipment, kayaks, laundry facilities. All cabins have ensuites, air conditioning and movie and music selections.